On Thursday the ECB convenes to announce changes to its interest rate policy and on Friday the EU Summit concludes in Brussels. We think the ECB should cut 25bps to address contracting growth forecasts and are positioned for a Summit outcome not dissimilar to previous Summits: disappointment. Here we do not expect to get definitive color on Europe’s next steps to address its sovereign and banking crisis beyond guidelines on a fiscal union to monitor budgets of member countries, which alone will not provide intermediate term support to European capital markets. It’s worth noting that Europe already has had a fiscal union of sorts, named the Stability and Growth Pact (to limit a country’s debt and deficit levels) which proved highly ineffective as its mandates were ignored by the majority of member countries (including Germany) at some point over the last ten years, and could simply spell another inefficient bureaucratic agency. At the last interest rate decision on 11/3 ECB President Mario Draghi surprised the market with a 25bps cut to the main interest rate to 1.25%. On Thursday, we’d expect a similar cut as Europe’s macro environment continues to deteriorate, despite the move by the Fed and global central banks on 11/30 to reduce the interest rate on dollar swap liquidity swap lines by 50bps. Key statements from Draghi’s last speech highlighted the “ongoing tensions in a number of euro area sovereign debt markets” and the "impact of the still high energy prices, protectionist pressures and the possibility of a disorderly correction of global imbalances”, all of which and we think should encourage a cut. 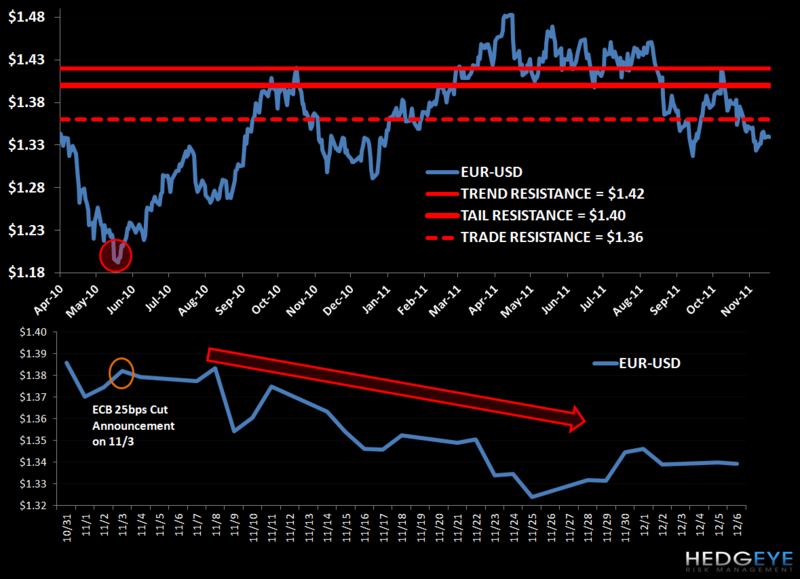 We’re looking for $1.36 in the EUR-USD as a level to short the currency pair and expect the lack of resolve out of the EU Summit to drive EUR-USD weakness (more below). In the chart below we show the move in the EUR-USD post the 11/3 announcement, which is 3.2% lower today. We don’t see material downside support in the cross until its previous low of $1.21. While capital markets may see a short-term rally on any rumors (which we expect to be abundant) and initial statements around the Summit this week, ultimately we think Eurocrats will not craft solutions necessary to put medium term support in markets. Frankly, we still don’t think Eurocrats have answers in hand—the prevailing thread continues to be a willingness to keep the Eurozone intact, however without the firepower to do so on the sovereign or banking sides. We see European banks and the sovereigns needing a funding facility to the tune of $2 to 3 Trillion [$1.25 to 1.75T to recapitalize banks and $0.75 to 1.25T to fund future sovereign deficits]. The current EFSF has a mere €250 Billion left to address both fronts. Further, we do not see the Chinese riding in on a white horse with a significant loan or the IMF in a position to lend in the area code of our target. Remember, despite recent rumors that the IMF may make a €400-600 Billion loan to Italy (on 11/28) or that central banks may funnel loans through the IMF to select countries to the tune of €200B (12/1), the IMF only has €385 Billion in lending capabilities. So even in a scenario in which the IMF unloaded all of its balance sheet on Europe (which is highly improbable, and don’t forget that the USA is the largest contributor at 17%), this “max” loan would still come up short of addressing Europe’s banking and sovereign funding needs to sustain a medium-term market rally. In the balance lies the central question: if peripheral European countries can’t grow and can’t fund themselves with rising credit spreads, and therefore can’t balance their budgets no matter how much austerity is delivered, aren’t allowed to default (Greece), and can’t adjust monetary policy, 1.) how do weak states get out of this vortex? and 2.) what’s the benefit to weaker states to be bound in the Eurozone? If it wasn’t clear before, yesterday’s meeting between France’s Nicolas Sarkozy and Germany’s Angela Merkel solidified that Sarkozy is Merkel’s puppet. This unified voice supports maintaining the Eurozone fabric and Friday’s big news should center around the implementation of a fiscal union, Germany’s counter proposal to its rejection of the issuance of Eurobonds or using the ECB as the lender of last resorts. Ultimately, a fiscal union is at best a 2.0 version of the Stability and Growth Pact, which already exists in the main treaties to limit member countries to 60% debt as a % of GDP and 3% deficit to GDP. Here Merkel notes: “The lessons are very simple: Rules must be adhered to, adherence must be monitored, non-adherence must have consequences. Leaders have to overcome fundamental flaws in the construction of the euro area…. We are going to Brussels with the intention to change the EU treaty." Unfortunately, since the Euro’s creation, numerous countries, including Germany, have violated one or both of the Pact’s limits. Should Eurocrats run in the direction of preserving the Eurozone’s current fabric, such a fiscal union is marginally bullish, however could well signal another bureaucratic institution that may at best have longer term benefit but contribute little to present sovereign and banking imbalances, which the market is demanding. While we view the actions of ratings agencies as lagging indicators, yesterday’s move by Standard & Poor’s to place the ratings of 15 Eurozone nations on CreditWatch negative and today’s announcement that the EFSF’s AAA rating is being placed on CreditWatch negative, adds one more bee in the Eurocrats’ bonnet ahead of Friday. S&P said that ratings could be cut up to one notch for Austria, Belgium, Finland, Germany, Netherlands, Luxembourg – and by up to 2 notches for everyone else (France, Italy, Spain, Portugal, Ireland, Slovakia, Slovenia, Estonia, and Malta.) [Note: Greece was spared, and Cyprus remains on negative watch]. While S&P said it would review following the Summit, its warning portends negatively for the EFSF, a facility that is built around its AAA rating. Should downgrades come to Germany and France, its main contributors at 28% and 22%, respectively, we’d expect funding costs to rise, which negates the very purpose of this facility. In short, this will further force Eurocrat hands to meet the demand (especially by the periphery) of sovereign issuance, which we increasingly think can only be met by ECB participation. Remember, the ECB continues to state that its secondary bond purchasing program, the Securities Market Program (SMP), is only intended to be a temporary program. Last week the SMP bought another €3.7 Billion (versus €8.6 Billion in the previous week) to take its total since May 2010 to €207 Billion. Should the Eurocrats look to maintain the Eurozone’s fabric, this temporary rhetoric, and ultimately the size the ECB’s involvement, will have to change. In our preview, we do not expect announcements on Friday to directly address the pressing sovereign and banking risks. First, we do not see an expansion/leverage of the EFSF without the ECB’s involvement, which we expect the Germans to continue to stand against. Second, we don’t expect Germany’s stance against the issuance of Eurobonds to change. Third, we see banking risk rising without more explicit funding packages. Insolvent banks in this environment will struggle to raise money on the secondary market, may well not have the sovereign backing, and it’s clear the EFSF is far undercapitalized to meet their needs. Here we think French and German banks will be critical to watch. Under these scenario we don’t see the market cheerleading post Friday’s announcement if in fact the bulk of the announcement is focused mostly around the establishment of a fiscal union. Further, there’s nothing on the calendar in terms of summits, etc. into year-end around which markets could get behind. We remain short France via the eft EWQ in the Hedgeye Virtual Portfolio.